Welcome to Sukhothai – northern Thailand’s most famous ancient city and a UNESCO World Heritage Site. Literally translated to “Dawn of Happiness,” Sukhothai was founded in the 13th century and served as the capital of Siam for 120 years. During that time, King Ramkhamhaeng and his successors built thousands of temples, statues, monuments and other buildings. Today, hundreds of those ancient structures have been rebuilt and are accessible to visitors. So grab your passports and time machines and let’s travel to the ancient kingdom of Sukhothai. While visiting most ancient cities in Thailand and Southeast Asia, your experience is marred by a sea of tourism. In Sukhothai, it often feels like you have the entire place to yourself. This feeling of touristic freedom creates a sense of comradery when you do eventually run into a fellow traveler … usually riding past you on a bicycle or motorbike. It’s worth mentioning that tour buses from Bangkok and Chiang Mai unload their hoards on the ruins every day around lunchtime. However, you can easily avoid them by spending the night in the eponymous town of New Sukhothai — located 12 kilometers from the ruins — and getting an early start to your day. At dawn, the last remnants of the dark blue night are etched out by the silhouettes of stupas, chortas, Buddhas, columns, and an ancient skyline. Shortly after, the sun’s first light peeks through the old city, reflecting it’s golden light in the nearby lotus pond. Get your cameras ready! While the easiest way to traverse the 12km from New Sukhothai is by motorbike, the most rewarding way to explore the ancient kingdom is by good-old-fashioned push bike (aka, a normal pedal bicycle). You can easily rent one from the many vendors outside the complex. Plus, if you get tired, your motorbike is always waiting. Sukhothai’s admission structure is divided into five different areas: the inner city, north, west, south and east sites. You can buy a ticket to each one individually for 100 baht, or a 5-zone pass for 350 baht. However, the pass is only good for one day – so if you’re spending multiple days at Sukhothai, it’s worth plotting out your visit beforehand. Another advantage of getting around Sukhothai on two wheels the ease of which you can avoid the crowds when the tour buses arrive. There’s nothing more satisfying than leaving a temple you had to yourself, getting to the parking lot, and seeing a gigantic tour bus and four large cars unloading. According to Thailand for Visitors: “The old inner city was enclosed by a rectangular wall about 1.8 kilometers by 1.4 kilometers. The walls consist of two earthen berms and a third wall made of earth but cased in laterite. Water filled the space between the three walls. A single gate in each wall controlled access to the city. Three of the gates were fortified. Wat Mahathat is the largest and most important temple in Sukhothai. Home to a giant Buddha statue, five ponds, 10 prayer halls, and nearly 200 stupas, the temple sits at the center of the old city. 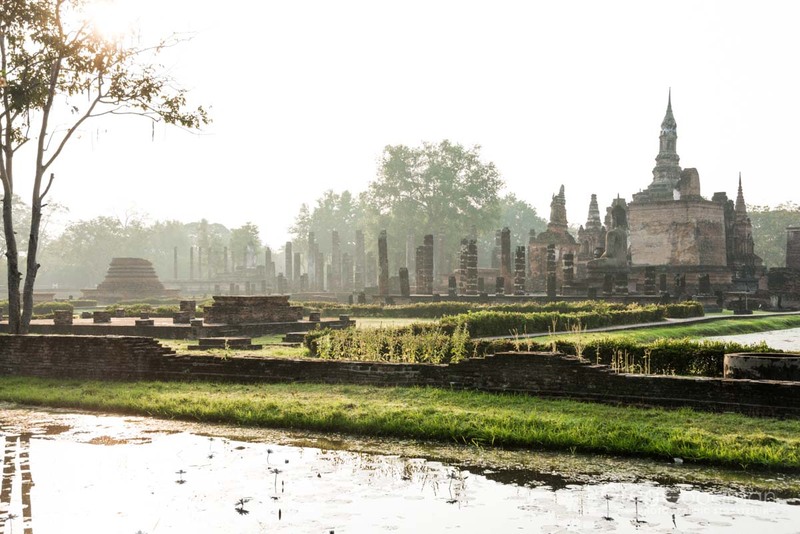 While the exact dates of construction are unknown, archeologists have surmised that it was continuously modified for nearly 500 years until Sukhothai was abandoned in the 18th century. Wat Sa Si (temple of the colored pond) is both chedi and ancient burial site. Sitting on an island in the middle of an artificial moat (Traphang Tra Kuan), the temple is flanked by the reconstructed columns of the old ordination hall. Photographing Wat Sa Si offers shutterbugs a multitude of options. The bridge leading up to the temple provides wonderful leading lines, while the grassy embankment across the moat offers lovely reflections and something green for your foreground. Perhaps the most memorable architectural feature of Sukothai is the gigantic Buddha statue inside Wat Si Chum. At 50 feet tall and 36 feet wide, the view from Buddha’s feet is truly awe-inspiring. Translated to ‘Temple of the Bodhi Tree,’ Wat Si Chum captures your imagination before you even arrive. Visible from the walkway is a single narrow slit in the building’s facade, which offers a preview of what’s inside. The Buddha image is itself quite striking, and not just for its setting. The image is known as Phra Acana, which means ‘one who is not frightened’ or ‘unperturbed’. The fingers of his right hand, which is extended down to summon the Earth Goddess, are long and delicate. They have been, of course, covered in bits of gold leaf by contemporary Thais. According to legend, a Burmese army invading Sukhothai fled at the sight of this image. Shrouded in the dense forest that surrounds the old city, Sukhothai’s east, south, west, and north zones are well worth the effort. With a wide range of temples, stupas, Buddha statues, stone paths, and other artifacts, exploring them is an adventure worthy of Indiana Jones. Even with a motorbike, be ready to sweat as you climb up countless hills and narrow stone steps to get to almost every historical site. I personally used my motorbike to explore the outer zones and was very happy with that choice. That said, if you’re up for even more exercise, the area is completely navigable by bicycle. Your choice! Out of all the temples in Sukhothai, Wat Si Sawai is the closest to a Khmer-style ruin (ie, Angkor Wat). Built in the 12th century, historians say it is the only temple in the ancient city that was built for devotees of Hindu gods. Architecturally, the small structure is highlighted by three massive prangs (towers) that rise far above the nearby walls. Each of these towers represents one of the “holy trinity” of Hinduism: Brahma (the creator), Vishnu (the preserver), and Shiva (the destroyer). prayer halls were later. Centuries later, Wat Si Sawai was converted into a Buddhist monastery – highlighting the difference in architectural styles and religious beliefs that make Sukhothai so unique. When I visited Sukhothai in 2013, it just happened to be the King’s 86th birthday. As such, the ancient city was decorated and a huge celebration was held to honor him. Schoolchildren of all ages carried floats and played instruments while ladyboys and ladies alike performed traditional dances. Devotees marched down the new and old streets, VIPs in fancy cars waved to the crowd, and the mayor of New Sukhothai gave out awards to locals for reasons I couldn’t translate. Finally, once the day became night, King Bhumibol Adulyadej was celebrated once more with an epic firework display over the ancient city. Truly a magical tribute to an amazing man. My heart swelled with joy as I followed the marching band and thousands of yellow shirts – all joined together in unity to share their love for the King. I was a bit disappointed that I had just bought a yellow shirt the day before and left it in my hotel room. That should be my biggest problem in life: that I wore the wrong shirt to a party. The entire city stopped moving and all eyes were glued to the TV when the King gave a televised speech to thank the Thai people on his birthday.